It couldn't last, could it? Uninterrupted sleep, what was I thinking? I should return to last night as I was trying to sleep the noises in the room next door began to build. First, it was a scrap here and a bang there until it progressed onto what sounded like furniture rearranging. Only stopping when perhaps the Feng shui was just right or the voices in their head told them they'd done enough to appease the dark overload. After those shennanigans, I was woken abruptly, just after 6am to a series of loud bangs. Then came the stomping, more banging and the return of the furniture rearranging. You'd think a herd of elephants was in the adjacent room. It boggles the mind to think one person could make so much noise in such a tiny room. I could feel my germanic good vibes dissipating quickly. 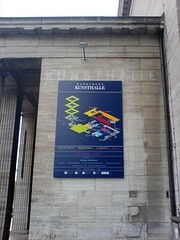 I'd decided, in light of my northern neighbour that I would be visiting the Kuntshalle, that's not right, Kunsthalle. 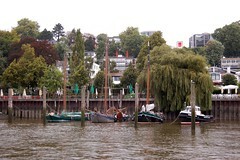 It's the museum of art and supposedly one of the most important art galleries in Germany. 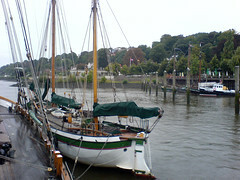 After having flicked through the tourist information, a visit to the Ovelgönne historic harbour was also on the cards. They have on display 20 restored old ships. I won't bore you with breakfast details as it's the same as the last two days. As I leave for the day and lock my room, who should be coming out of their room to also leave? The noisy swine from next door. From appearance, I can't tell if it's a butch girl or an effeminate male. I do know whatever they are, they are a first class *@((@!_!*#&#(. First item on the agenda is a train from Stephanplatz to Lucksbrucken - good timing sees me waiting less than a minute for the train's arrival. Less than 15 minutes later I reach the destination. Now I know that the 112 bus runs from here to Ovelgönne, I'm just not quite sure where the stop is. I eventually find it, when a bus pulls up on the opposite side of the road. A bad set of traffic lights see me miss it "by that much" (Vale Don Adams). It's a 15 minute wait for the next one, however Germany's timing is still up the creak and the bus arrives late. For god sake, they need to settle this election. As fate seems to be going on this trip, my arrival at Ovelgönne coincides with the starting of the rain. I only manage a few shots before I call it quits. The rain is coming down way too heavily and the lens is smattered with rain drops. I do take some shots with the camera phone just to give a general idea of the place. It's while I'm at the dock that I discover that there's another way here - and that's by the HVV ferry service - it will actually take me back to Lucksbrucken. Some 10 minutes later the ferry rolls up and by this stage the rain is hammering down. During the trip you can also feel how the ferry is struggling under the force of the waves, I certainly wouldn't have wanted to have been on that little canal boat with these waters - I'd be needing a bucket to bail out the water. It's here that I meet the gentle natured german school children...Not. What a feral bunch and their in-effectual teachers would do our most useless state school teachers proud. These kids were basically doing whatever they wanted, smashing each other into walls and other people. I managed to dodge a bag in the face during one of their shoving matches. They were also locking each other in the toilet. I wonder if these kids are here from Cologne? I had thought about visiting the Rickmer Rickmer's ship at Langebrucken but quickly decide against it once I see the number of school kids heading that way. I'd probably end up overboard. After now having wasted an hour without accomplishing anything and the rain not seeming to abate, I decide to visit the Kunts, umm Kunsthall. 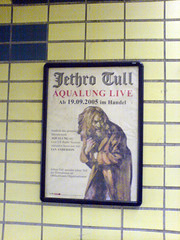 Paalo will be busting his flute that he missed seeing Jethro Tull playing Aqualung Live. 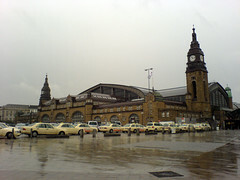 There's no shortage of taxi's at this station and from here it's a short but damp walk to the gallery (once I worked out where it was). What can I say about Hamburger Kunsthalle? It wouldn't surprise me to find Ralph Rembrants and Joe Van Goghs in this gallery. I think you really need more than one painting to justify calling it the Rembrant room. In comparison to say the National Gallery in London, this one is kinda sad. At the Picasso room, I was expecting work by Peter Picasso. Instead, to be fair, they were Picasso's - sketches, not paintings. It was now time to check out the contemporary art section - consultng the map proved difficult as it really didn't make any sense. I ended up asking the ticket seller, she nodded and smiled and efficiently gave the directions. Maybe she does it alot. You have to go through the museum shop and through some other rooms and then through the restaurant and then some a flight of stairs and bingo bango you are there! Simple isn't it? German effeciency at work again. Since I was in the shop I took the opportunity to look for something to buy, maybe a guide on the collection. 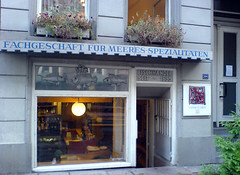 It was slightly surprising that everything was in German. That made my decision pretty easy - I would be getting nothing. As I continued on I was stopped at a doorway - I had no idea what the guard was saying, so I pointed to my map - eventually she said ticket. Oh, I have to show her my ticket before I could get any further. You'd think you'd hire guards that spoke more than 2 words of english, but that's just crazy talk. The contemporary art collection certainly is....different. I think they theory behind it is to make it as big as possible. I have to be especially careful in places in case I can't recognise where the art stops and the floor starts. Certain sections are closed off as more installations are being set up - I pass by a unpainted wall and I'm still not sure whether that was one of the pieces of "art" or just an unpainted wall. The contemporary art building is designed as a hollowed (it's not the only thing hollow in this gallery) cube, at the base of the hollow core is a sculpture - and it so reminded me of the Simpson's episode when Homer becomes an artist. This thing had chairs and umbrellas hanging off - I swear there must be a bbq in there somewhere. They say good art is supposed to evoke an emotional response - I wonder if hysterical laughter is an appropriate response? When I eventually leave the gallery it's still rainy so I train back to the hotel - where I have a late lunch in the hole in the wall restaurant. This place is quite interesting. Run by Italians it only has one (maybe two) choices for lunch and it changes daily. There really isn't seating you just stand up along the bars and eat there. 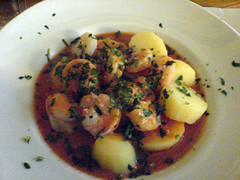 What can I say about this simple dish of Prawns and potatoes in a spicy tomato broth. Simply Divine! Huge fresh prawns, with a slight crispness as you bite into them, the flesh vibrant and juicy. Potatoes pieces like sponges absorbing the prawn flavours. The tomato broth offering a perfectly matched spice to compliment the prawns - the crusty italian bread perfect for soaking up the juices. Hmm, you can say I like it.